CHOCOLATE okay, so I misled about the sophisticated bit; Belgian chocolates are as divine as they come (expensive too). 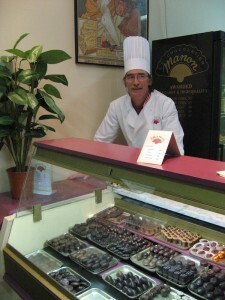 Belgium makes over 172,000 tons of chocolate each year and sells hand-made goodies in over 2000 shops. 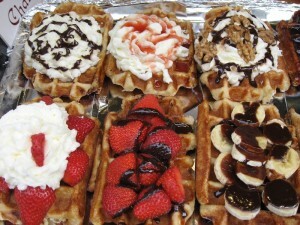 WAFFLES—some like them plain, other prefer waffels topped with sweet sauces, fresh fruits and whipped cream. My advice—try them all. 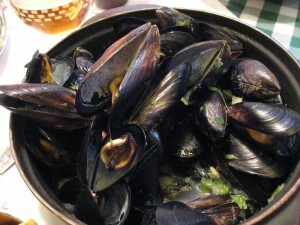 MUSSELS—so very very good, especially consumed with frites and beer. MMmmmmmm! 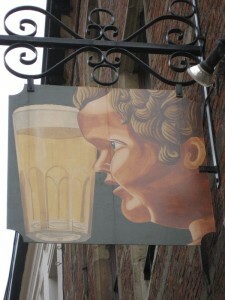 BEER—over 450 varieties, many served in their own uniquely designed glasses. SPECULOOS/SPECULAAS— crunchy, buttery, spice cookies, often sold shaped as, or stamped with, images and figures. 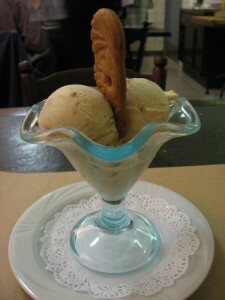 Try to find speculass ice cream—a vanilla treat enhanced with the cookie. 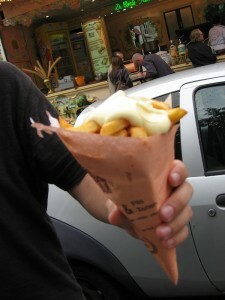 FRITES—served with mayonnaise—yes, rich, thick, calorie-packed mayonnaise. 1. Peel potatoes and cut into sticks. 2. Soak potatoes in ice water for about 30 minutes, drain and pat really dry with paper towels. 3. Heat oil in a deep-fryer to 325 degrees, add potatoes and fry until cooked through, but not brown. Drain well and put in a paper bag or a paper-towel lined dish –close top of bag or cover dish with foil. At this point you can let the potatoes sit for 10 minutes to several hours before the next frying. 4. Before serving, heat oil in the deep fryer to 365 to 375 degrees, add cooked potatoes and fry until they are nicely browned. Drain well on paper towels, sprinkle with salt and serve immediately.